The additional module PharmSchul WEB is used for displaying all training via web interface. Training will still be created in the PharmSchul system. The confirmation of the training will be done in PharmSchul WEB. Class room training can alternatively be managed analogue the previous procedure by using a participation list with manual signatures. The training manager is able to send invitation eMails to participants as well as to trainers of a training. By following the link in this eMail the participant or rather trainer is able to confirm or to cancel the participation. In case of a cancellation, the corresponding participant or rather trainer will be deleted in the training and the training manager will be informed by eMail for his further planning. The employee is able to get an overview of his training (reading training and class room training) by using PharmSchul WEB. For all training the employee is able to sign electronically in PharmSchul WEB. With the electronic signature in PharmSchul WEB the participation is directly entered in the PharmSchul system automatically. 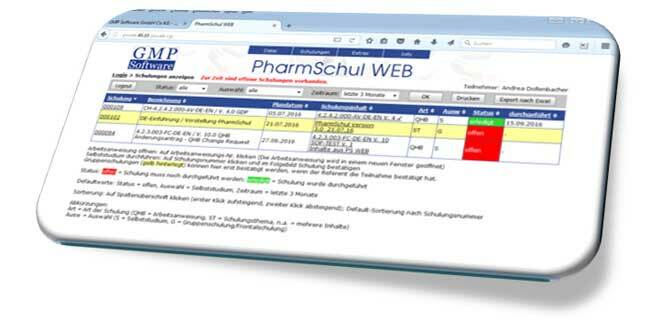 PharmSchul WEB offers the possibility to give access to the document, so the participant is able to open the document via PharmSchul WEB. The participants are able to perform success control tests via PharmSchul WEB. Of course PharmSchul WEB is validated.